[May 11, 2017] (Reuters) - From cacao beans to truffles, the history of chocolate has been curated inside New York's first museum dedicated to the sweet treat. 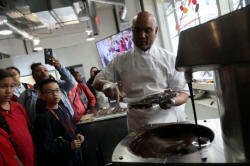 Choco-Story New York, created by pastry chef and chocolatier Jacques Torres, opened in March at Torres' flagship sweets store in Manhattan. "I love to transfer the love that I have for chocolate and the knowledge that I have for chocolates to whoever wants to learn about it," Torres, known as Mr. Chocolate, told Reuters. The French-born chef demonstrated how to make a chocolate truffle, pouring rich liquid chocolate into molds and filling it with a creamy, soft chocolate ganache. The exhibition includes the early origins of chocolate from the Mayan civilization some 5,000 years ago, the tools used to create chocolate from the fermented cacao bean, and even special cups with a small bar inside to protect mustaches from hot chocolate.